Lentils with Fresh Vegetables. All natural. Perfectly spiced. Low fat. Just add water. Vegetarian. Create Indian home style culinary delights like a pro! What's so special? Home style cooking, in small batches with fresh, natural ingredients using nutritional recipes that deliver authentic tastes and aromas. No preservatives, nothing artificial. Jyoti prepares a range of delicious Indian foods for today's life styles. Heat 'N Serve: Matar-Paneer (cheese and peas), Delhi saag (spinach/mustard greens), Punjabi chhole (spicy chickpeas), Jaipur Karhi (organic potato dumplings in spicy buttermilk), Madras Sambar (lentils and vegetables) and Dal Makhani (lentils and beans in a delicious sauce), which can be heated in the microwave, oven or stove top. Also, baby dark chickpeas (kala channa) - a versatile gourmet bean and a variety of delicious masala simmer sauces. 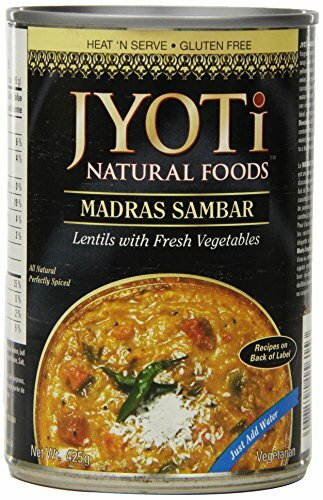 Joyoti madras sambar is a fragrant entree, side dish or a soup made with toor dal (split yellow lentils) and freshly chopped onion, bell pepper, egg plant and carrot. Sambar requires only water to be added. Heat 'n serve entree. Product of USA.